Our unique ground floor rooms are sympathetically converted old farm outbuildings, each with an individual entrance onto a courtyard. All four rooms are spacious with en-suite shower rooms, complimentary beverage trays and individual heating. We offer the combination of high quality four star accommodation and a relaxing and informal stay in this lovely part of South Norfolk. We serve breakfast in a converted barn, overlooking mature gardens and open fields. Enjoy a traditional English breakfast, lingering over the delights of locally sourced food and the atmosphere of a log fire on colder mornings or dine ‘alfresco’ on the terrace in fine weather. 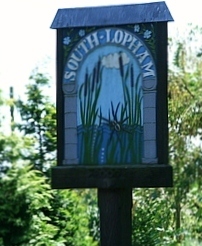 South Lopham is centrally placed to explore East Anglia and is an ideal base for anyone visiting the area either for business or pleasure by car, bike or on foot. Diss market town, Bressingham Steam Museum, Banham Zoo, Snetterton Race Track, a number of country parks and a whisky distillery are all 15 minutes or less from Pansthorne B&B. In under an hour you can drive to the east coast, Norwich, Bury St Edmunds or the Norfolk Broads. STRENNETH, a family run business in unspoiled countryside, 10 minutes drive from the market town of Diss, 5 minutes from Bressingham Gardens and close to Snetterton motor racing circuit. First class accommodation in 17th Century building, fully renovated with single storey courtyard wing. Ample parking and nice walks. All 7 bedrooms are ensuite and tastefully furnished (2 with 4 poster beds). Extensive menu using local produce. Ideal touring base. You are welcome to relax in the living room, reading or enjoying some music — we expect you to make yourself at home. On colder evenings there is nothing quite so enchanting as a log fire in the inglenook, the traditional days end in a thatched Norfolk farm house. You’ll be staying in one of the three guest bedrooms situated on the first floor, bearing the names of composers — as seems fitting for the home of two musicians. Vivaldi is a single bedroom with a large ensuite shower room, Verdi is a twin bedroom with ensuite bath, and Rossini features a four poster bed and ensuite shower. The bedrooms are very different in character, but all feature hand painted Hindelopen decoration and a wonderful view of St. Nicholas Church. We welcome you to stay with us at to our Grade II listed Granary, originally erected in 1822 as part of Oxfootstone Farm. Our two holiday units are opposite ends of a former pig farrowing shed a short distance from the Granary, recently converted into quality self-catering accommodation. They are in a quiet location in open countryside with long distance views, but only a short distance from the A1066 between Thetford and Diss. Oxfootstone Granary is an ideal British holiday destination. This lovingly restored 15th-century, timber-framed, detached barn is located in a tranquil village setting and boasts a beamed interior, patio and garden with unspoilt views across open fields. Ideally positioned for a holiday to explore the magnificent coastlines and lovely countryside of Norfolk and Suffolk; historic Bury St Edmunds and Norwich city are also easily reached. Nearby Diss provides a wealth of shops and restaurants and Southwold and the Suffolk Heritage Coast are 50 minutes away. Thetford Forest with Peddars Way footpaths, national cycle route, children’s adventure playground, and Banham Zoo (3½ miles) for great family days out. Bressingham Gardens and Steam Museum (4 miles). Daily boat hire available to explore the Waveney Broads. Shops 1¼ miles, pub 300 yards.